BELLATOR MMA PRESENTS A SPECIAL DOUBLEHEADER ON DECEMBER 2 & 3 FROM THE WINSTAR WORLD CASINO & RESORT IN OK.
SANTA MONICA, CALIF. (October 10, 2016) – Bellator MMA is thrilled to announce the promotion’s first ever Friday/Saturday doubleheader event. The first night of entertainment will feature a bantamweight world title rematch pitting current division champion Eduardo Dantas (18-4) against a dangerous former two-division champion Joe Warren (14-5), which joins a previously announced featherweight showdown between A.J. McKee (5-0) and Emmanuel Sanchez (13-3). Meanwhile, the second night of action will be headlined by a featherweight fight pitting former champion Pat Curran (22-7) against John Teixeira (19-1-2). The unique doubleheader event will take place on Friday, December 2 and Saturday, December 3 inside WinStar World Casino & Resort in Thackerville, OK. Tickets start at just $45 and can be purchased at the WinStar World Casino & Resort Box Office, as well as Ticketmaster and Bellator.com. 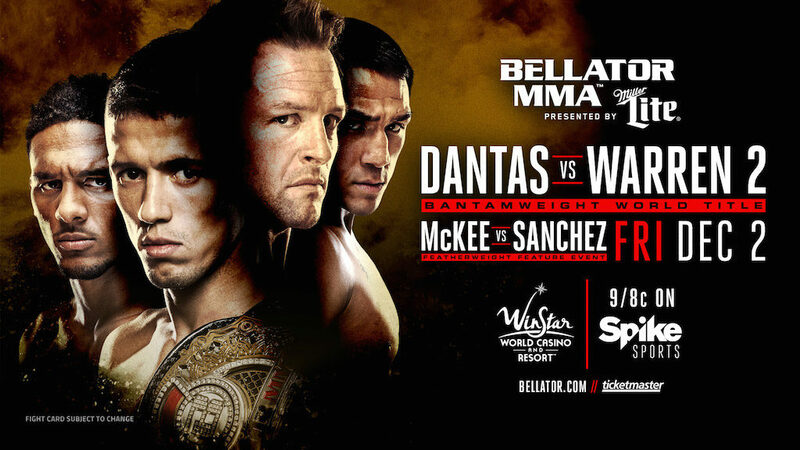 “Bellator 166: Dantas vs. Warren 2” airs live and free on Friday on SPIKE at 9 p.m. ET/8 p.m. CT, while preliminary bouts will stream live on Bellator.com and The Bellator Mobile App. 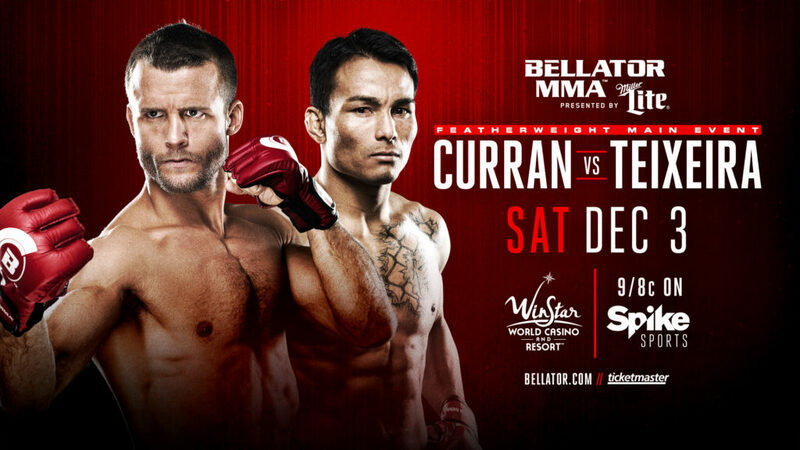 “Bellator 167: Curran vs. Teixeira” airs live and free on Saturday on SPIKE at 9 p.m. ET/8 p.m. CT, while preliminary bouts will stream live on Bellator.com and The Bellator Mobile App. Additional bouts will be announced in the coming weeks. Warren will be looking to duplicate his success against the feisty Dantas, after defeating him in a five round, 25-minute bloodbath that took place in the same venue nearly two years ago. The win capped off a five-fight winning streak and allowed Warren to unify the 135-pound title. A native of Denver, Colorado, “The Baddest Man on the Planet” has now emerged victorious in seven of his last nine bouts, including his most recent finish over former UFC competitor Sirwan Kakai at “Bellator 161: Kongo vs. Johnson.” At 39 years old, the former two-division Bellator MMA champion will now attempt to become the oldest fighter to win a championship in Bellator history. Bellator MMA veteran Pat Curran will enter the cage for the 17th time under the direction of the Scott Coker-led promotion, which will tie him with David Rickels for the most in the promotion’s history. On top of that, “Paddy Mike” will have the opportunity to join Patricio “Pitbull” for the most wins in Bellator MMA history, with 13, if he can emerge victorious. Since joining the promotion in 2010, Curran has accrued 12 wins, including notable victories over current featherweight champion Daniel Straus, former featherweight titleholder Patricio “Pitbull,” and former bantamweight/featherweight king Joe Warren. The 29-year-old Crystal Lake, Illinois native comes in on a hot streak, having won two consecutive bouts and nine of his last 12. With two World Title victories and a pair of successful title defenses under his belt, Curran has proven time and time again that his name belongs atop Bellator MMA’s always-competitive featherweight division. The 29-year-old Teixeira continues to make a name for himself in Bellator MMA’s featherweight division, as he makes his fourth appearance under the promotion’s direction. Similar to his opponent, Teixeira also steps into the cage on a recent string of success, having won three straight and seven of his last eight bouts, including a trio of first-round knockouts. Prior to his days with Bellator MMA, Teixeira began his professional career fighting exclusively in Brazil, posting an undefeated record of 12-0 with one draw. The upcoming bout marks only the fourth time in Teixeira’s nine year career that he will fight outside of his native Brazil. With 14 of his 19 career wins coming by way of knockout or submission, you can be sure to see “Macapa” go for the finishing blow early and often in this mouthwatering matchup.